Space was borrowed from an existing office to provide more open area and easier navigation in the kitchen. 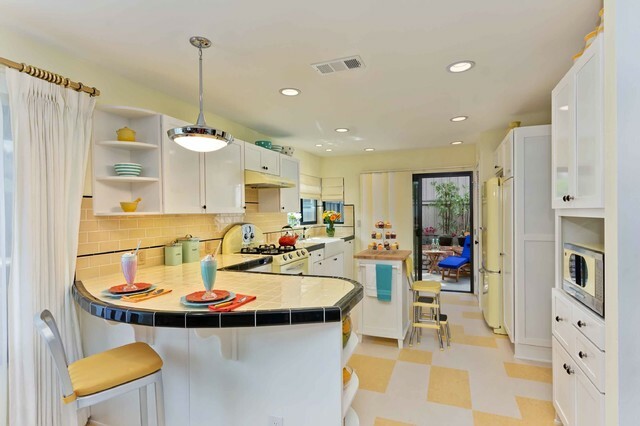 Bright, optimistic yellow sets the tone in the room, with retro-inspired appliances in buttery yellow chosen as key elements of the design. A generous apron-front farm sink gleams with clean white enameled cast iron and is outfitted with a rare retro faucet with spray and scrub brush attachments. 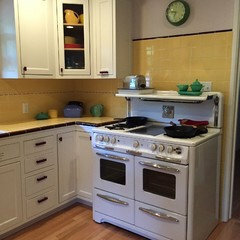 Black trim against the yellow ceramic tile countertops defines the kitchen’s lines. Simple maple cabinetry painted white with black ceramic knobs provides a modern level of storage. Playful positioning of contrasting tiles on the floor presents a modern, quirky interpretation of the traditional checkerboard pattern in this classic kitchen with an original point of view. Can I get 4 x4 yellow tiles? would you recommend the light over the bar area to be used under an window? 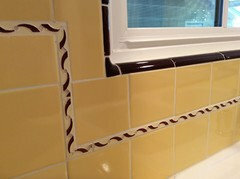 I used resources from RetroRenovation to find my 4x4 yellow tiles and maroon surround for my eventual kitchen remodel. It all started here! Yes, that was what the client was hoping for and she loves how it turned out! Desperate for yellow countertops - I am searching high and low for yellow countertops, but all I can find is laminate? Any ideas where I can find yellow like the ones pictured here? Or quartz? Or other non-laminate material? yellow and white floor tiles on kitchen floor. - where can I get these floor tiles please? Hi - Thank you for your question! The floor tile is called Marmoleum Click. The colors are Natural Corn and Barbados. Retro kitchen cupboard - What are those rounded shelves at the end of the cupboard called if I wanted to order them? Hi - Thank you for your question. The rounded shelves on the end are actually a cabinet that comes with rounded shelves already installed. This is not something that can be bought in a store. It comes from Diamond cabinetry line and it is called a wall quarter round end shelf. I'd like to know about the light hanging above the peninsula. Hi - Thank you for your question! The light hanging above the peninsula is Kichler Lighting- Fremont Convertible Pendant 1Lt- K42136CH. Can you tell me what tiles are on the backsplash - glass? - And also where I could get them? Thanks! Florida Tile Retro Classic Mellow Gold. What is this floor? I'd love to have something similar. Thank you, we love this retro floor too! It is called Marmoleum Click. The colors are Natural Corn and Barbados.